Where can you buy one of the best car batteries in Downers Grove? At Firestone Complete Auto Care. Stop by for your free battery test today! All too often we wait until our car or truck battery is completely drained before getting a new one. Without a healthy battery, your trusty ride isn't very useful. In Downers Grove, Firestone Complete Auto Care is the shop to visit for battery check-ups, replacement, and service. If you're wondering about an engine that's hard to start or new check engine light, your battery is crying out for help. A swollen, bloated case, low fluid, or a leak are also clues pointing towards a battery that's on its way out. Talk to our technicians about the best battery for your car today—before you hear the dreaded "click!" Come to Firestone Complete Auto Care for a free battery check in Downers Grove. We'll tell you how much longer your battery has to live, along with the temperature it could quite. 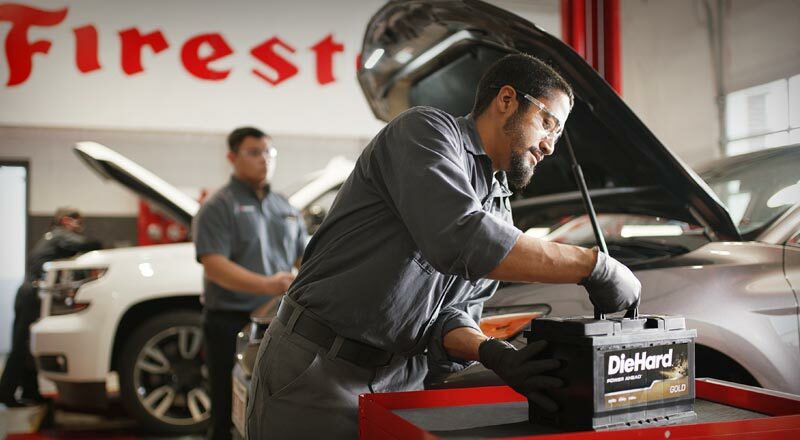 Our technicians can help you choose the best car battery for your price range and climate. We install over 800,000 batteries each year and only trust America's top replacement battery, Interstate Batteries. They've been the industry leader in reliability and performance since 1965, and that's time tested technology and experience we trust. From test to installation, our services help make sure your vehicle runs its strongest, from summer through winter! A healthy car is made up of many healthy, well-tuned parts. Your automotive battery may give your car the power it needs to get started and stay running, but other parts are important too. There's your tires, engine, steering and suspension, brakes, alignment, filters, and more! Firestone Complete Auto Care in Downers Grove is the place to go for all of it. You'll receive the best in total car care, from the moment you drive into our parking lot! So whether you need a dead battery replaced, you're shopping for Bridgestone tires, or you need an oil change in a jiffy, make an appointment online and visit your nearest Firestone Complete Auto Care. Qualified technicians are standing by to find the right solution for your vehicle! From drivetrain services to steering and suspension to tire repair, rely on your nearby Firestone Complete Auto Care for your automotive service needs. We're your local car care center, tire store, and automotive shop combined into one. Our skilled technicians work hard to help ensure that your vehicle runs the way it should. When you bring your car or truck to us for maintenance, we promise affordable prices and exceptional service. Explore our services and at your convenience, schedule your next courtesy check or repair in Downers Grove, Illinois today.